Whilst the wide screen form factor has slowly become the modern standard for monitor and televisions there is a growing support for the ultra wide 21:9 aspect ratio with more and more manufacturers entering the market. The BenQ XR3501 is a 35″ curved model with gamer friendly credentials including a super fast 144hz refresh rate. It also features a VA panel, a break from the TN and IPS technologies that tend to dominate the monitor market. The ultra wide form factor might not have universal support quite yet but it is a growing trend with consumers enjoying the immersive feel in games and the extra space for working in Windows. 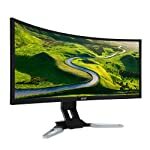 These monitors can do away with a dual monitor setup and can easily be split down the middle to show side by side images. When buying ultra wide monitors it is worth pausing for a moment to think about the size you might like. Screens are typically measured across the diagonal so an ultra wide 35″ monitor is actually going to be a similar height to a 27″ wide screen monitor (and obviously a lot wider!). If you prefer the height of 24″ wide screen monitors you might want to look at buying a 29″ model. The BenQ is a solid, sturdy beast, and it needs to be because these screens are not small. You need a strong base to support the overall weight of the display. Perhaps it is too rigid as you are unable to change the height, but you do get the opportunity to tilt. Of course a 90 degree rotation makes no sense on one of these! The XR3501 has a 2000R curve which helps to ensure the outer reaches of the monitor fall more naturally within your eye line. Whether you like this effect or not might be personal preference but the general consensus seems to be that the curvature aids the use of such a wide screen. There are Two HDMI 1.4 ports included, but if you want to run 1440p an 144hz you will have to use the DisplayPort sockets. There is also a mini-DP port and headphone port. The XR3501 adopts a VA panel, a technology that attempts to make up for some of the deficiencies in TN and IPS based systems. As a result, the response times aren’t quite up to the same speeds as a TN panel, but you do get improved image quality. The quoted 4ms grey to grey response time shouldn’t trouble anyone and in fact professional reviewers have scored the BenQ well for input lag, cranking the refresh rate up to 144hz will give you a smooth responsive experience that should keep serious gamers most satisfied. The 21:9 screen ratio will give you an unrivaled sense of immersion that the traditional wide screen setup can’t compete with. That said, remember that this format does not have universal uptake just yet so some games won’t have native support for ultra wide. But when it does, playing open world games won’t ever feel the same again once your used to this new way of seeing things. We give the BenQ XR3501 a 5 out of 5 rating. Want to know what existing owners of the monitor think? You can read real user reviews here. 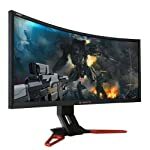 Should I buy the BenQ XR3501? The XR3501 isn't cheap but it has good game performance thanks to its low input lag and fast refresh rates. The curved 35" screen is stunning, this upgrade will allow you to experience open world games like Witcher III in a way you've never experienced before. The only pause for thought however is that this is a 1080p screen, at this size, a 1440p resolution would give you a sharper image still. If you are having some doubts about this purchase then why not read some real owner reviews and see what other buyers think. Welcome to the BenQ XR3501 FAQ. This section attempts to answer common questions you may have, please get in touch if you have any more queries or if you think our answers need updating. Is the curve any use? Some argue that the curve is a matter of preference but it does start to pay off when you get to the larger screen sizes. With the ultra wide format a curve actually helps to give you a more natural view.